From radio stations to newspapers, Thursday is always referenced to as “Thirsty Thursday.” I’d like to make an attempt to bring that to A Shot of Brandi*. Let’s pop a bottle of champagne like we won the championship game and start this Thursday off with a lesson in Prosecco. Last Saturday, the girls and I went to a BYOB restaurant in The ‘Burgh for some dinner and drinks on the eve of Amy’s bridal shower. We all brought some bottles for the road and I brought with me some Prosecco. I couldn’t really sell this in with the girls’ because I’ve just had it before and liked it. Well Prosecco has been around for years. 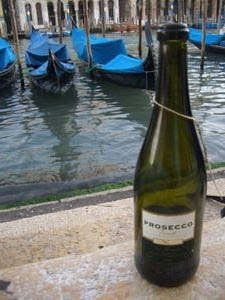 After doing some research on the ever trusty Wikipedia, I discovered that Prosecco is a variety of white grape grown in the Veneto region of Italy and gives its name to the sparkling wine made from the grape. It goes on to mention, like other sparkling wines, Prosecco is served chilled (good thing we let it sit in that ice bucket!). While it is commonly sipped on its own, Prosecco is the main ingredient in the Bellini (one of my morning favs!). It can also replace champagne in Mimosa. 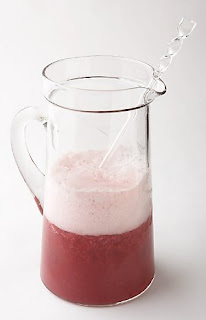 While I agree – Prosecco is awesome to drink chilled, here is a recipe for a Strawberry Bellini courtesy of the Food Network!